Fiberglass reinforced plastic and other composites influence the design of many products manufactured today. Boat hulls, sports equipment and airplanes can easily take new, complex shapes when composites are used in place of traditional materials. Reinforcing structures also benefit from the versatility of composite materials when prefabricated components are bonded with a high-strength adhesive. This article will discuss some of the engineering aspects to consider when designing or repairing an adhesively bonded composite structure. We often simplify adhesive bonds into two categories; primary bonds and mechanical bonds. Primary bonds occur when epoxy is applied to a previously applied layer of epoxy that has not fully cured. The layers of adhesive bond as if they were applied at the same time and mixed together. Mechanical bonds rely on the adhesion of the epoxy to a substrate. To visualize this, imagine the epoxy flowing into all of the imperfections and the sanding scratches of the substrate and locking into place. In reality the forces are much more complex and beyond the scope of this article. Wet out the substrate. The epoxy must be able to flow and wet the surface. Surface contaminates can prevent this from happening. Let the epoxy cure in place. Clamps must remain in place and the joint can not be stressed until the epoxy cures. Use a high-strength epoxy. WEST SYSTEM® epoxy is a structural adhesive after it has cured. Various stresses can affect the failure of a joint and influence the joint design and the design of the product itself. It is important to understand these stresses when planning the product’s design. Shear stress occurs when the applied force is parallel to the bondline. 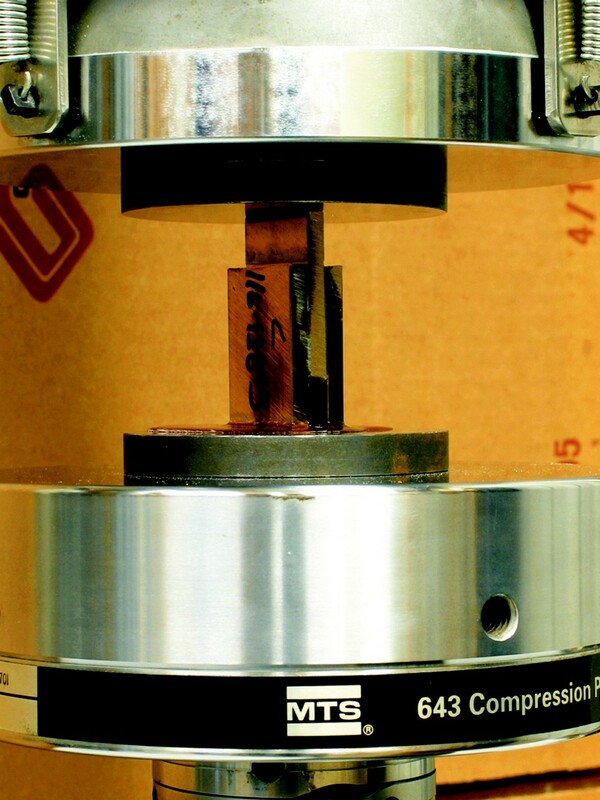 Adhesively bonded assemblies generally tolerate shear stress well. If you think of packing tape on a box, it works because it is in shear. It is very difficult to “slide” or shear the tape across the surface of the box. Single lap shear sample in the test machine. The sample is two aluminum plates glued with a 1/2″ overlap. The same sample after a shear failure of the adhesive. The distribution of stress in a bondline that is under a shear load is complex. Just keep in mind that the highest shear stress is at the ends of the bondline. Increasing bondline thickness can reduce the shear stress in the epoxy. Here at Gougeon Brothers we most often use the single lap shear test. This test pulls two tabs that have been overlapped by a 1/2″ until they come apart. 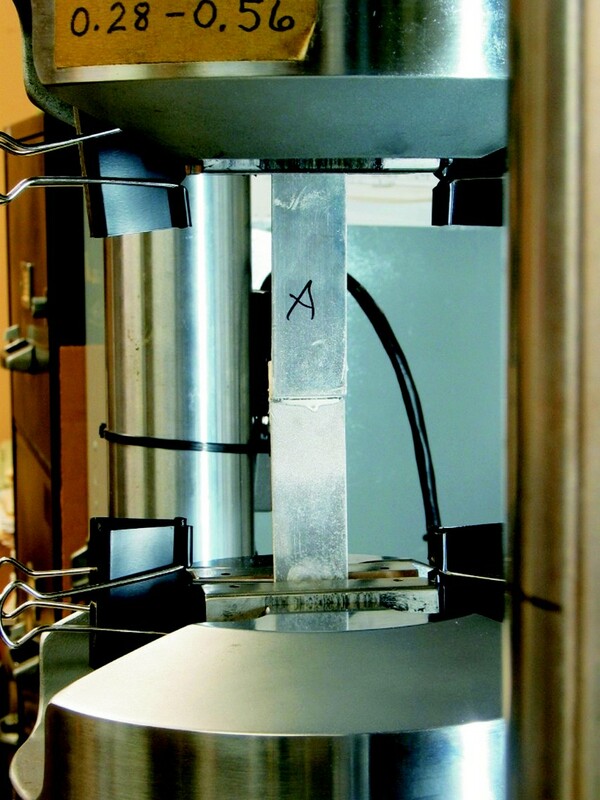 Because the samples are overlapped but the test machine grips are in line with one another, a slight peel is generated as the sample deflects. Although this is not pure shear, the introduction of peel makes the test more realistic in ways that will be discussed later. 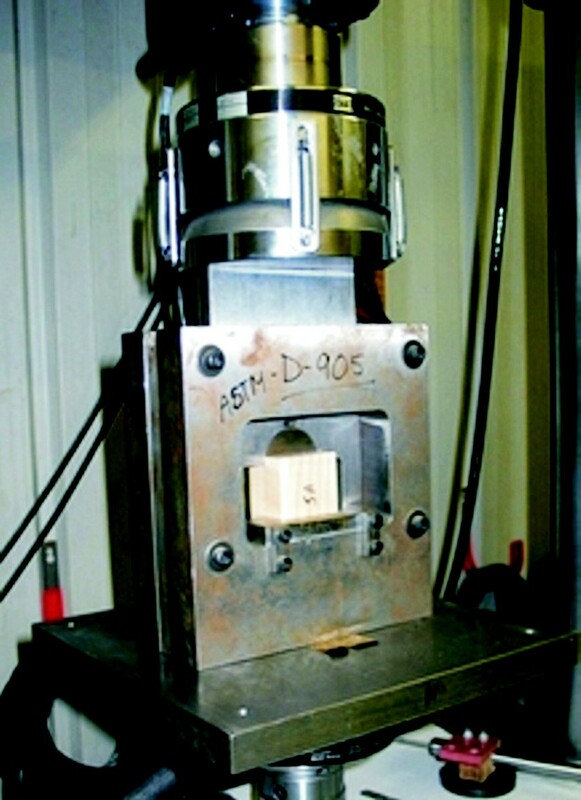 Double lap shear and ASTM D905 shear testing induce a load closer to pure shear. These specimens require more time to prepare and in the case of the ASTM D905 test, require a special fixture. We use these tests to more accurately determine the shear performance of WEST SYSTEM epoxy but as mentioned earlier, single lap shear often simulates real world applications better. 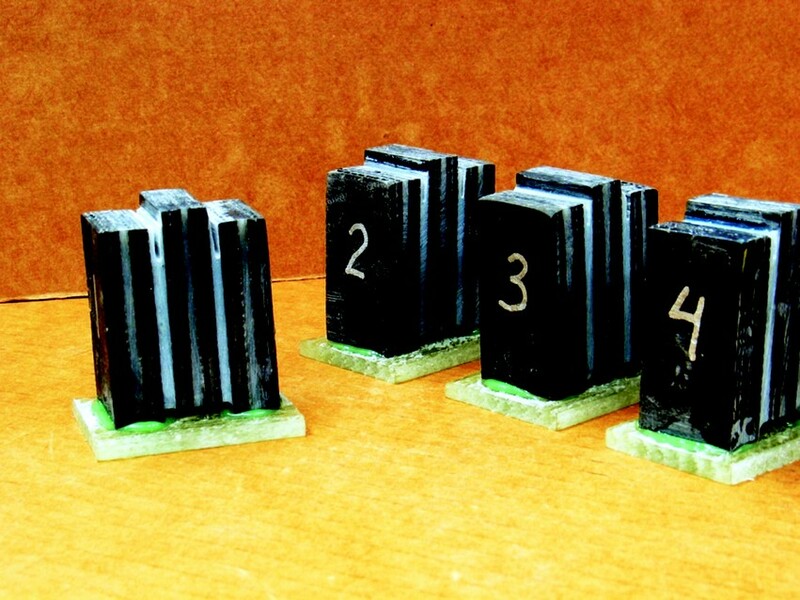 Double lap shear samples before testing. A double lap shear test in progress. The double lap shear test is more accurate that the single lap shear test. 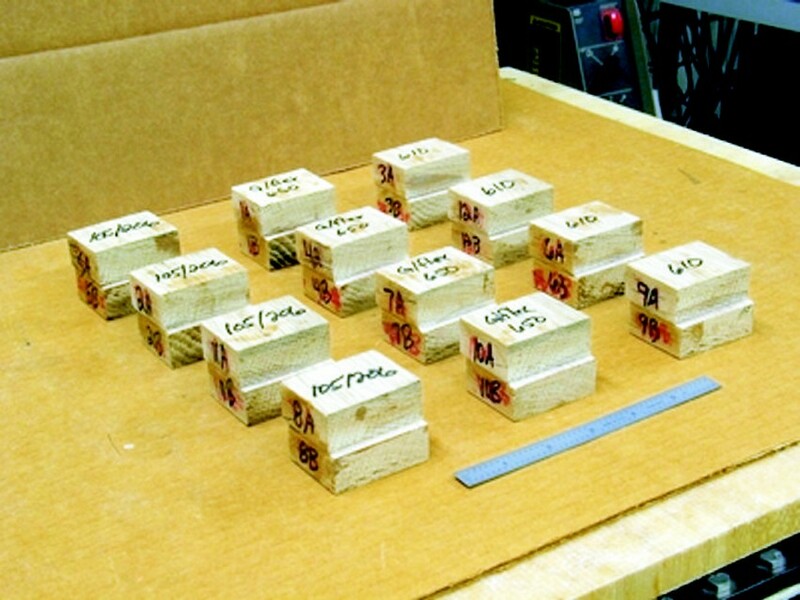 White oak, single lap sheer test specimens that have been prepared for the ASTM D905 short block shear test. The ASTM D905 test in progress. the test fixture is designed to minimize peel by presenting the sheer force on the specimen parallel to the glue joint. Tensile stress on an adhesive is created when a load is applied perpendicular the surface. The stress generated by the load may cause an adhesion failure that is much lower than the actual tensile strength of the glue. Tensile adhesion value is not the same as tensile strength. WEST SYSTEM epoxy is formulated to have high tensile strength for applications such as creating a strong fiberglass laminate, and high tensile adhesion to common substrates for strong bonds. WEST SYSTEM G/flex® is formulated to achieve the highest adhesion values. 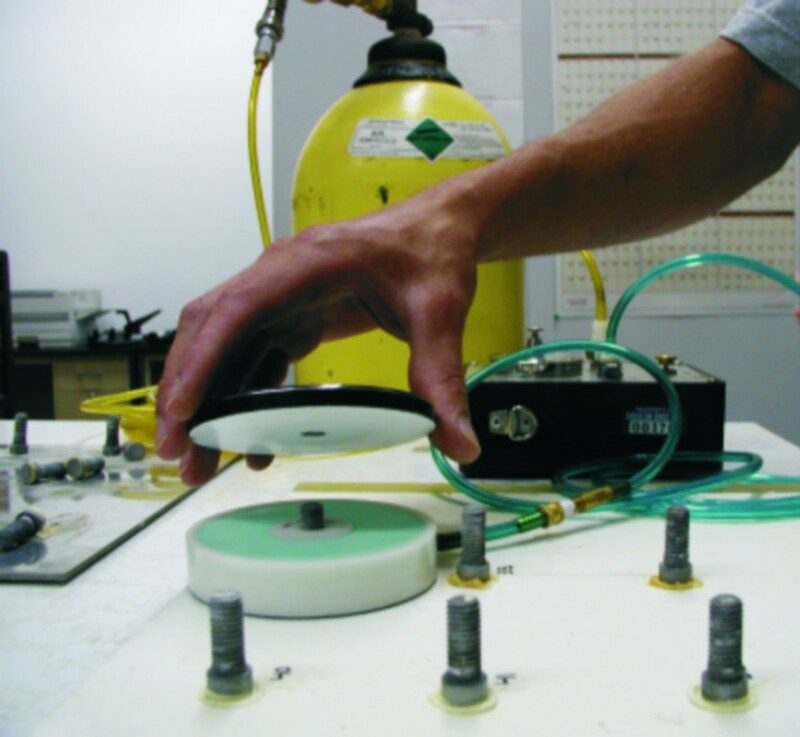 The Pneumatic Adhesion Tension Testing instrument, or PATTI device, uses compressed air to inflate a bladder that lifts a metal stud glued to a substance. A gauge measures the tensile force required to break the bond. Loads that result in pure tensile adhesion in the real world are rare. When a tensile load is applied to a structure it often causes the substrate to deflect. This deflection then creates a peel stress and can dramatically lower the strength of the assembly. It is also rare to have all the components assembled in such a way that the load path is purely tensile. A slight off-axis load can induce significant peel stress. We use a PATTI device to measure tensile adhesion. This device pulls on bonded studs perpendicular to the surface and measures the load required to pull them off. 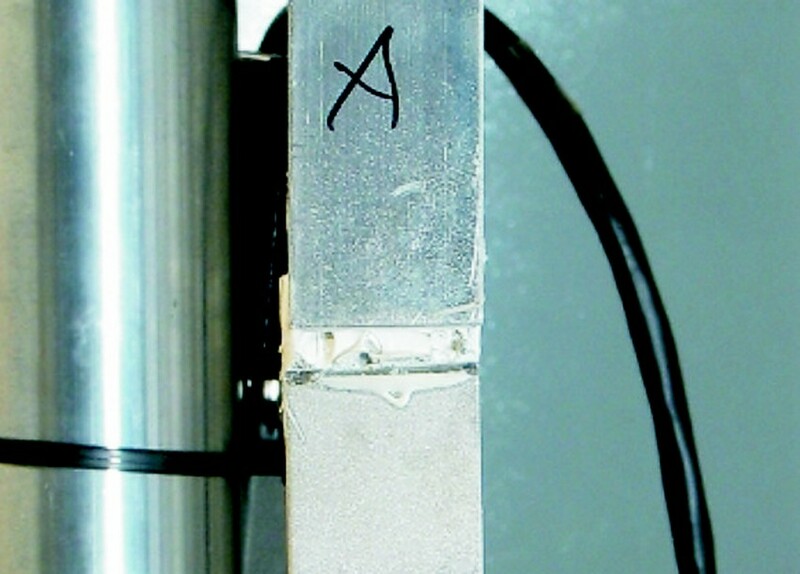 The Pneumatic Adhesive Tension Testing Instrument, or PATTI device, uses compressed air to inflate a bladder that lifts a metal stud glued to a substrate. A gauge measures the tensile force required to break the bond. Peel stresses are the most effective way to pull a bonded assembly apart. We do this every day when we pull off masking tape or get a wedge under a corner to pry something apart. A good design will minimize the amount of peel stress to which the bond line is exposed. Peel loads concentrate all the stress in a very small area. As the two substrates start to pull apart, a very high tensile load is created at the interface. WEST SYSTEM epoxy is formulated with enough elongation to help distribute this tensile force into the rest of the bond line. Two common tests measure peel stresses: the climbing drum peel test and the T-peel test. Both tests create a load at the end of the adherand and peel it away from the substrate. The force is measured in piw (pounds per inch width) not in psi (pounds per square inch). 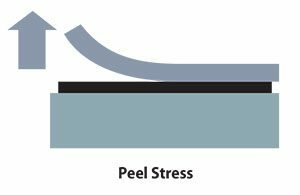 As discussed earlier, peel stresses are concentrated on the edge of the bond line, creating an extremely high and concentrated tensile load. The load is not distributed across the bonding area. This is why the width of the bond line is more important when measuring the stress on the overall area. Avoiding peel loads is important when designing and when bonding parts together. Pay particular attention to loads that may want to lift the edge of the bonded part off of the substrate. Often mechanical fasteners on the perimeter can prevent a peel from starting. Peel loads can also be generated from deflection of the components. An example would be a chainplate bonded to a bulkhead below deck. It appears that all of the loads are in shear, which in many cases is a good assumption, but if the bulkhead is not stiff enough when the hull is under high loads it may “bow” out of shape. This deflection may create a peel force along the edge of the stiff metal chain plate. There are many other scenarios where deflecting components may generate peel loads. If a bond line was in pure compression there would be no need for an adhesive. In reality, WEST SYSTEM epoxy is used as a chocking material to create a solid foundation and even support of a mechanical mounting system. In this type of application the compression strength is important as well as the resistance to creep stress. Creep failures from compression loads occur when the adhesive is permanently deformed by the constant force applied to the bond line. WEST SYSTEM epoxy is tested for resistance to creep stress. To reduce creep issues, have enough bonding surface so that the compression stress is well under the compression strength of the epoxy, and increase the bonding surface even more if the area will be exposed to elevated temperatures. When bonding to wood and some composite materials, the fiber direction on the surface must be considered. With wood substrates, a stronger bond can be achieved when the loads are in the same direction as the wood fibers. If the load is perpendicular to the grain, the applied load may “roll” the wood fibers over each other at a much lower force than if the load were applied in the direction of the grain. This is also a factor with unidirectional reinforcing materials. With metals, the Coefficient of Thermal Expansion should be considered. As temperature changes, many materials will change size and this will stress the bond line. WEST SYSTEM epoxy is tough enough to bond dissimilar materials together. Shear loads create the most stress at the ends, so for best performance take advantage of the strength of WEST SYSTEM by not over clamping to allow a thicker bond line. 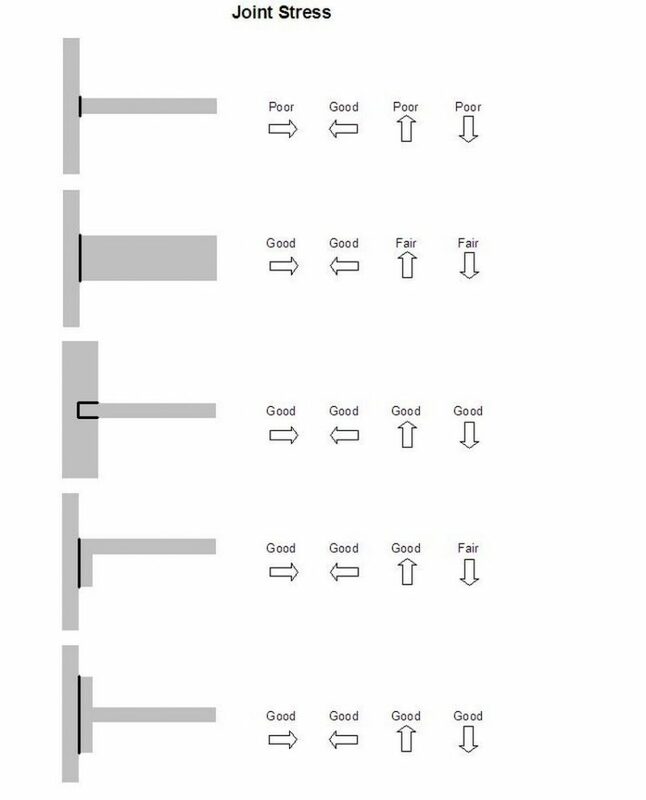 Try to have loads in shear. Avoid peel. adhesives with lower stiffness and higher elongation improve peel resistance. Chocking, fastener bonding and highly concentrated loads require a strong and stiff adhesive. Bond line thickness is driven by adhesive properties and handling characteristics. Maximize surface area. For peel loads, maximize width. We rarely see failures due to the strength of the epoxy. Problems are more likely to occur when the epoxy is allowed to cure too much before the parts are assembled, or the epoxy isn’t allowed cure sufficiently before a load is applied. Our customers are successful when they select a WEST SYSTEM epoxy designated as a structural adhesive with the cure profile that best matches their process and working conditions. In addition, best practices include preparing the surface properly and achieving the appropriate bond line thickness. When designing, building or repairing a structure that relies on bonded components for strength, please call our Technical Advisors at 866-937-8797. We would be glad to discuss your project with you. This entry was posted in Materials Testing, Techniques & Tips and tagged 34, adhesion, Epoxyworks #34, Jeff Wright, peel stress, Spring 2012 on June 10, 2015 by ewadmin.